This was the very first photo I ever took at Disneyland with a tripod. It was something I was considering for a while but unsure if it was allowed because I had never seen it done before. Not in the park or posted online. The year was 2005. A time when night time HDR Disneyland photographers didn’t exist yet. Suffice to say, I was incredibly nervous. Almost trembling. I decided on this spot because not only was the view great, but it was a hidden area where my tripod would not get in the way of guests and I could avoid any weird looks. Which seems ridiculous to say now since tripods are so common now in Disneyland. Another neat attribute about this shot was that it was taken during Disneyland’s 50th Anniversary, as you can see the 50th hidden Mickey to the right of the flume drop. 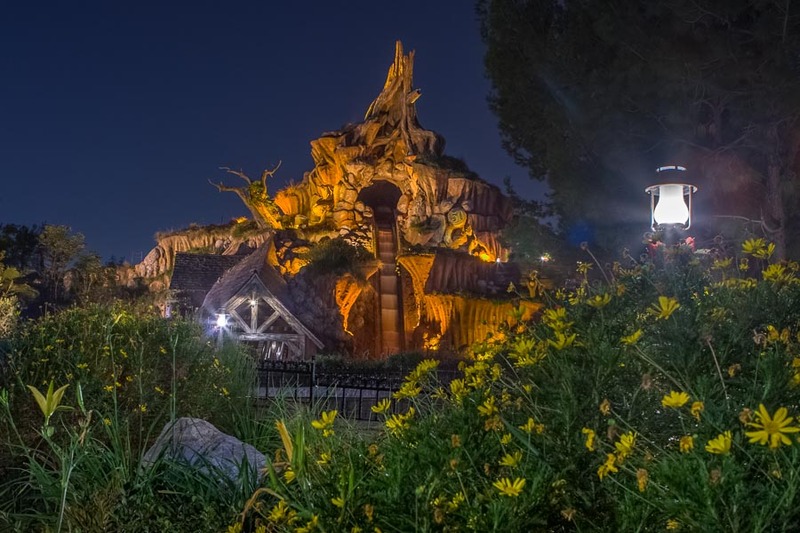 When I saw my first long exposure shot of Disneyland appear on the back of my Canon 20D’s whooping 1.8” LCD screen, my mouth dropped and I was filled with amazement and awe. I was undoubtedly hooked at that moment. For some it’s the Hatbox Ghost. For others, it’s the Hitchhiking Ghosts, Indiana or even Lincoln. For me, my favorite animatronic character in the park is the original Blackbeard. Since I can remember, he has been the one I have admired the most. And I’m not afraid to admit that I still have my Blackbeard doll from ‘Pieces of Eight’ that I purchased back in the 90’s and he’s the COOLEST! Braided beard, bandana, sword and all. When I heard the rumors that he was going to be replaced, I took as many pictures as I possibly could. Something tells me this won’t be the last you’ll see of him, ya lily livered lovers. He is the quintessential example of why, and how, I became passionate about taking pictures of beloved things at Disneyland as a personal keepsake before they were gone forever. The announcement was very close to the closure of Pirates so I didn’t have time for many trips. I vividly remember going on pirates on the last day of Blackbeard’s final performance. I could see that I was not alone as many, dressed in pirate garb in some form or another, were riding Pirates over and over till closing. By the way, thank you Mr. Cast Member for sending my boat thru 3 times in a row at the end. 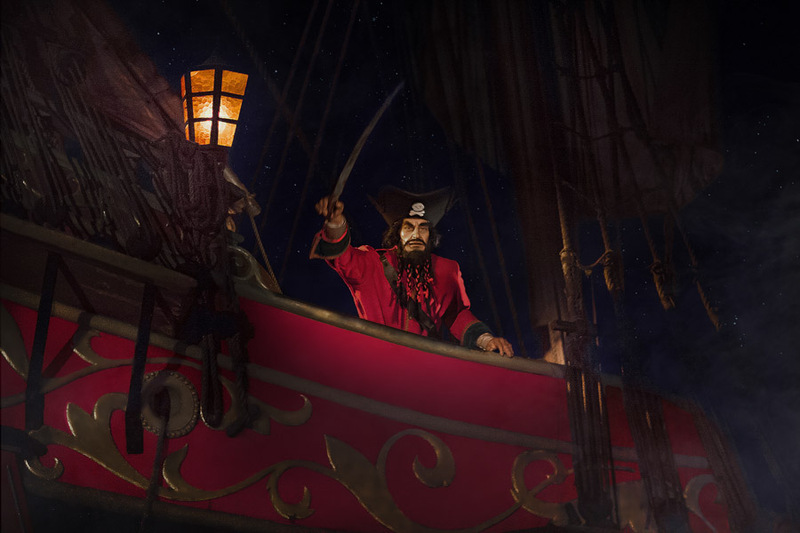 I will say, that last ride in my little boat passing Blackbeard in a fierce battle really knocked the wind out of my sails as I realized that would be the last time I would see him in this legendary iconic scene. But as I left the park that night, my spirits were lifted knowing that the images I took that day would allow me to preserve the memory of Blackbeard, the one created by Walt, Marc Davis, and John Hench, upon my walls. And situations like this are why I love photography. In general and especially at Disneyland. Every time I leave, I have a little spring in my step because I get to take home a piece of Disneyland each time and I can’t wait to come back for more. When it comes to photography, find something you love and shoot the heck out of it, I always say. Find it, admire it, adore it and capture it. If you do, you will not only be shooting with your eyes, but also with your heart and soul. Shoot what you love. Love what you shoot. 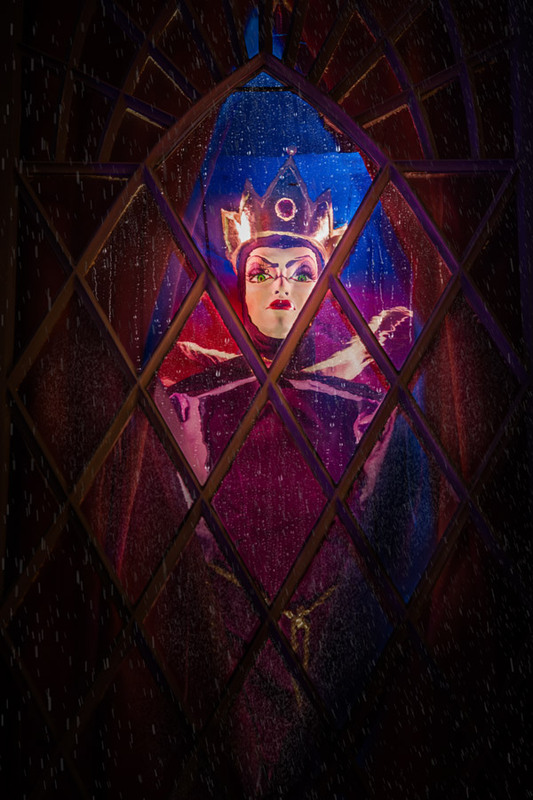 Out of all the Disneyland face characters in the park, the Evil Queen is my favorite. Her quick wit and light hearted sinister demeanor is a joy to watch. Watch her as she recruits her minions and rises above all the princesses. A real gem of Disneyland in my book. This was always such a peaceful spot at night. This is one of the earlier spots I ever photographed in the park. 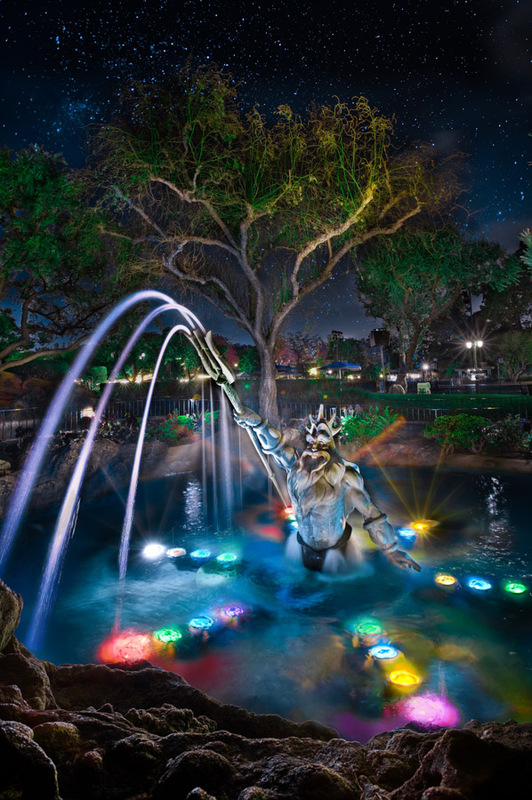 I’m so glad King Triton lives on at DCA. He is the King, after all. Walking thru the castle gates has always been a magical and enchanting experience for me. Crossing the bridge, thru the gates and then you hear the quintessential Disney song that can only express the magic of Disneyland like no other song can. 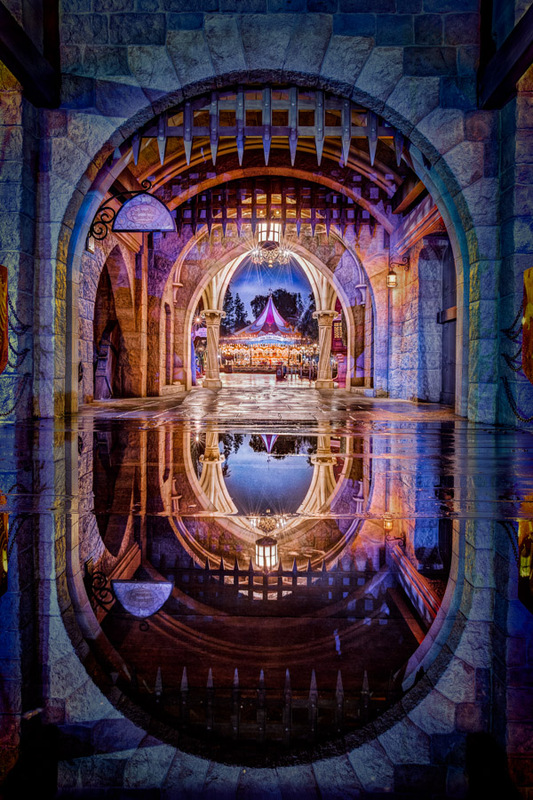 This is also a perfect example of why I love when it rains at Disneyland.